The concept for making handbags in metal began in 1983 in New York City, where an inner artistic potential was triggered by the variety and use of industrial materials that surrounded Wendy Stevens daily in the city. 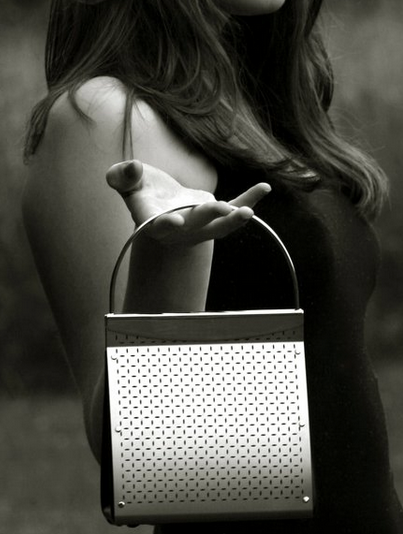 Working intuitively, in an environment of artistic friends, she began to create an original, unique style, resulting in a modern, durable and versatile accessory. All of her bags are made of stainless steel with leather and metal components and are hand fabricated and assembled in the refurbished production facility outside of Philadelphia. The use of stainless steel as the primary material has been effective in the strength, form and longevity of the product. When paired with the leather elements, the handbags become user friendly and ultra functional. Maintaining quality and precision in the fabrication of each piece is crucial. As the handbag collection evolves, possibilities for creating new models with diverse shapes, sizes and textures seem limitless. Desert Son of Santa Fe carries Wendy Stevens handbags. Contact our shop for inquiries on our current inventory.